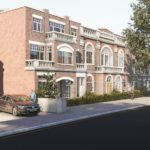 The scheme, designed by AJ100 design practice, rg+p, will comprise one studio apartment, five one-bedroom, 16 two-bedroom and three three-bedroom flats, alongside a four-bedroom apartment and a four bedroom townhouse. Pictured is an impression of the regenerated Feltham Magistrates’ Court development. A number of units will benefit from private balconies and gardens, with plans to incorporate a private residents’ roof space. On-site parking will be available, with eight spaces proposed.